Google’s well-known keyboard app, Gboard, has today quietly secured an update on iOS devices, bringing a minor (yet significant) modification in tow. The search giant is making the process of GIF creation using its keyboard app extremely simple by moving the record button into the word suggestion bar at the top. This isn’t a new feature that’s been added to Gboard today but has been there since September last year. It was previously hidden behind the emoji key and under the GIF section. Note: I tried this feature on my iPhone X, running Gboard (v 1.17.0.178984954) and it worked perfectly fine. I believe there isn’t a need for me to go into specific details of how to use this instant GIF-making feature since it really is dead simple. When you’re using Gboard as your default keyboard on any iOS device, you’ll see a new ‘camera’ icon plastered at the extreme right of the word suggestion bar. Tap that and you’ll be taken to a GIF recording screen (as seen on the right). There you will have a choice of two modes: Loop and Fast Forward. While the ‘Loop’ option allows you to record a quick Instagram-like Boomerang, the ‘Fast Forward’ option will see you capturing a minute-long video (that’s a lot of antics) that is sped up to create a time-lapse sort-of-thing. 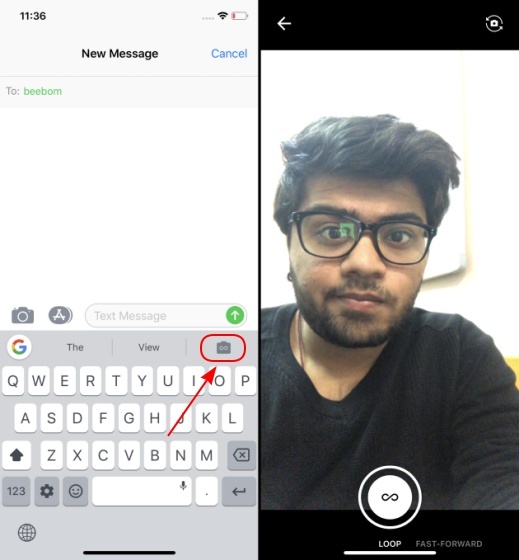 Once you’re done recording, you need to hit the send button to copy the GIF, which you have to paste in the message box to actually send it over. As for Android users, Gboard may be your preferred choice of a keyboard but you still do not have the capability to make and share GIFs from it just yet. Google has only made this available for iOS users, presumably to attract them away from the default bland keyboard. But, if you’d like to share goofy GIFs of yourself in conversations on Android then you can turn to Google’s ‘Motion Stills’ app to make it happen. This app turns your live images into GIFs, just adding one more step before you share it with your friends. It isn’t as simple as tapping a button on Gboard’s suggestion bar but it works mighty fine. We can expect to see this feature rollout to Gboard Android users in the coming weeks. So, are you already plotting to spam your friends with GIFs all day? Let us know your opinions on this change down below.